Leads are not just potential sales; they are individuals with a wide range of interests and concerns. Leads are not just potential sales; they are individuals with a wide range of interests and concerns. To convert these leads, you need to access all their information rapidly, so you know the best course of action to take to make a sale. You not only need to know about previous contact with the lead but you need to go further back to know things like what type of property they are looking for. If someone is after a 3-bedroom house, suggesting to them a 2 bed bungalow will not get you a sale and might lose you a lead. By logging all communications you can go back and look at the lead’s initial enquiry, but doing this each time you need information is a slow and time consuming way of operating. Having access to a wide variety of information about your lead, all in one place, and in significant detail will streamline the operation. This is precisely what the IDXmatrix CRM offers you; a page that details everything you could ever need to know about your lead. Within the CRM there is a section that lists All Leads, by clicking this and finding the name of the particular lead you are dealing with, you can then access a wealth of information about that client. The history tab will give you access to all previous communications, but you can also see what tasks are outstanding and what priority they are. You can see their recent website visits and property searches, their most popular searches, and which properties they have viewed. 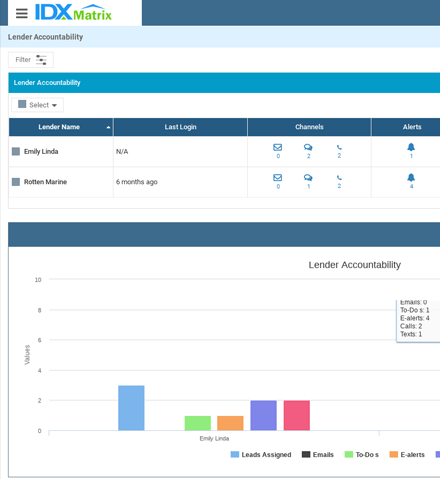 It also allows you to access data on Lead Mindset and to create E-alerts, ensuring you complete all tasks on schedule.